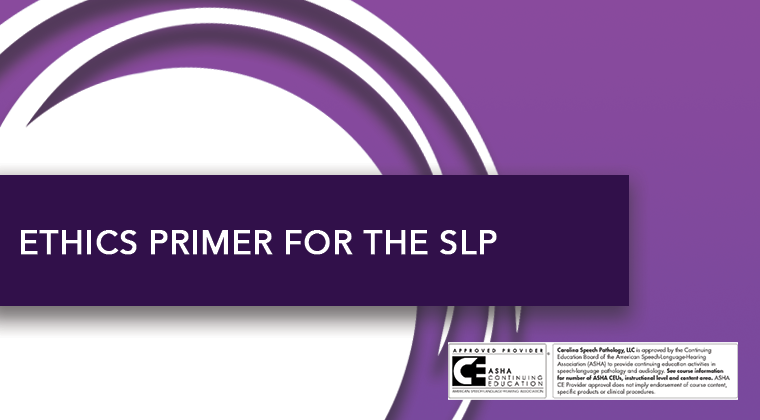 This one-hour recorded webinar familiarizes the SLP with the foundation of medical ethics and ASHA’s code of ethics which guides our clinical practice. This course provides history of ethics, review of medical ethics, review of the law as it relates to ethics, and provides strategies for navigating potential ethical situations. Summarize the history of ethics, ASHAs code of ethics and medical ethics. Describe the law as it relates to ethics. List strategies for navigating potential ethical situations. Vanessa Peregrim has the following financial relationship: she is a paid employee of Carolina Speech Pathology. No payment was received for creation of this webinar. Ms. Peregrim has no non-financial relationships to disclose. Vanessa Peregrim received her Masters degree from Loyola University in 2006 and her BCS-S in 2018. She is one of our Clinical Lead SLPs and also carries an active caseload. She provides mobile FEES to the Maryland/DC/VA territory for CSP. Prior to joining CSP in 2016, Vanessa worked at University of Maryland Medical center in the acute care and outpatient setting with adults and pediatrics. She has presented posters and lectures at ASHA and Maryland State Association Conferences and taught Ethics at the graduate level. She currently teaches Advanced Dysphagia graduate courses at Loyola University of MD.. She has been deemed competent for supervision and training in FEES by a board certified Otolaryngologist.